We live in a dangerous world where privacy and security are more important than ever. In order for software to be trusted, the source code must be available to verify — a simple trust and verify model. Purism is proud to release all of our source code under Free Software licenses that not only empower users but are vital to protect their privacy and security. We favor licenses with strong copyleft like the GNU General Public License version 3, and will release software under the GPLv3 or an FSF-approved license we inherit. Our code can be studied, verified, and shared, whether you use our Librem line of products or not. Software Freedom Conservancy is a vital and important part of the Free Software ecosystem that we at Purism and billions of people worldwide rely upon. Without organizations that protect and enforce the terms expressed in software licenses, our digital rights are at risk. Conservancy continues to play a central role in legal battles to safeguard these freedoms. License enforcement is only part of the story, and Conservancy assists its member projects by handling all matters other than software development and documentation, so the developers can focus on what they do best: improving the software for the public good. Many of these member projects play a critical role in the advancement of privacy and security, such as the Reproducible Builds project and coreboot, one of the standout security features of Purism’s Librem laptops and upcoming smartphone. 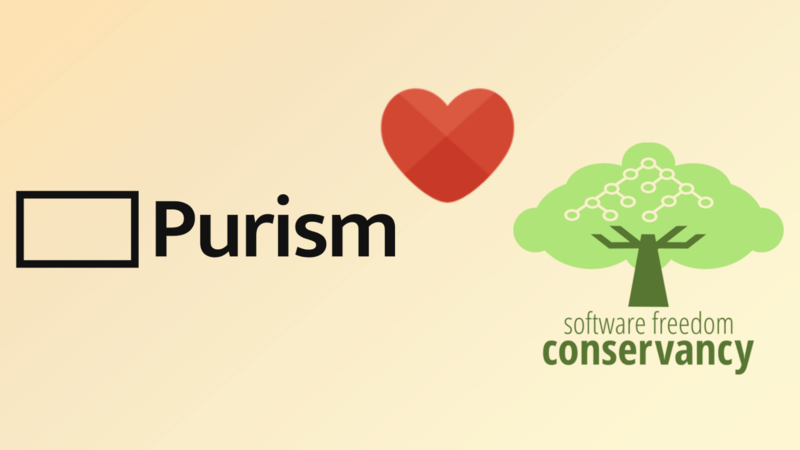 Purism is delighted to contribute $1,000 USD to support Software Freedom Conservancy. Their funding drive ends today and we urge everyone who utilizes Free Software as part of their daily workflow or toolchain to donate to Conservancy and help them reach their fundraising goals.